Inquiring minds want to know why we too should befriend Mercyinreach! Want to tell the world what you love about Mercyinreach? You need to log in or join our community, first! It's fast, free and easy. Support My Journey as an Author with a Donation? Click here. Want To Like My Author Page On Facebook? Click Here. OFFLINE - BREAK - Taking another short break, got most rps replied to but not feeling well today so I'll be back tomorrow most likely. I'm back to getting work done now. I will be doing the third draft of my book 'Ignited' from the 1st until the end of April. I'll try to get everyone a post when their turn comes up but some days I might be too tired/mentally drained. Feel free to still hit me up OOC to talk and we can talk when I'm taking breaks and such during the day. Due to having so many RPs, being unwilling to let most of them go because of loving my partners and our stories, yet also getting a bit overwhelmed, I've decided to organize my RP's into three different categories to ease the pressure and help me feel more organized, espeically during the work week. Below I will list the three and the names of the characters that have been placed in each, and this determines when and how often you'll get replies under the stipulation that I'm not sick or too exhausted. Anyone in this list will be getting replies once a week on Mondays given they have replied already. This is in no particular order; but if you've been placed here it is likely because you have shown a once a week or less frequency of replying. Anyone in this list will be getting replies once a week on Fridays given they have replied already. This is in no particular order; but if you've been placed here it is likely because you have shown a once a week or less frequency of replying. Anyone in this list will be getting replies twice a week on Saturdays and Wednesday's given they have replied already. This is in no particular order; but if you've been placed here it is possibly because you have shown an twice a week average of reply frequency. Anyone in this list will be getting five days a week Monday through Friday, given they have replied already. This is in no particular order; but if you've been placed here it is possibly because you have shown a post frequency of five times a week on average or more. I leave my phone logged in so when it says I am 'online' I am not online unless my currently says so. If my profile says online but my currently says something else, then I am not online. Hey there lovely! I'm Deirdre. I'm friendly, demisexual biromantic person and super proud of it; but most importantly I am a creative and inspired young self-published author who also enjoys spending my spare time storytelling through RP. I have some serious chronic pain that makes it difficult to do much outside of the house, so RPR has become a place I can most likely be found when I am not doing my once weekly grocery shopping and once monthly writers group. I joined RPR almost three years go. I am currently working on two books, the first to be published in September 2019, the second hopefully at the beginning of 2020. (Check back for more information!) I've been writing in general for nine years, and RPing for almost three years, not counting some minor RP I did when I was quite young. I spent the majority of my time drafting and plotting novels, watching Good Mythical Morning and other YouTubers, chatting with my friends via text or call, watching shows, listening to music, posting about fictional characters, and taking lots of selfies and outfit photos for social media. Of those things, writing and communicating with my friends probably mean the most to me. I will always stick up for and do anything I can to help a friend. * I am female but my gender falls in the line of 'Demigirl' which means I mostly/partially identify as a girl but not completely. I am fairly gender nonconforming. My prefered pronouns are she/her or they/them. I am always open to new friends however please PM me before ending me a friend request so I know who you are. PM's are only open to those 18+ at the moment for the foreseeable future. 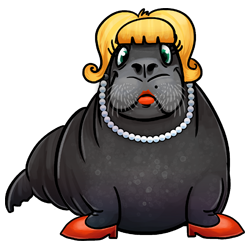 Betty is a very sophisticated walrus that prides herself on her natural elegance and fashion sense. No mucky outdoors life for her! She resides in a mansion of her own design, flopping on velvet lounges and dining on the freshest salmon. RP Status: Tentatively Closed. Unless I post on the forum looking for something, I most likely will not be starting any new RPs; but if you have a really good idea, give messaging me a shot and we'll see. Sci-fi, rarely ever, but sometimes. Drama, action, mystery, angst, always. Always. I write sexual content very explicitly, and do not fade to black except in very specific circumstances. I only RP with characters 18+ no exceptions. OOC is 18+ as well, I am uncomfortable talking to those under 18. I write minimum of two paragraphs or 250 words, and prefer my partners do the same. I write almost always at a 10th grade level or higher, and prefer the same, but as long as you are detailed, and keep me interested, I am not the grammar police. When will I be online posting you ask? Here is my updated April Schedule. Note: During the November and December Holiday season I will not be posting as frequently. I believe in equality of all people of every gender, sexuality, and skin color. I adore human beings and love is love. I will not stand for the mistreatment of women or sexism, whether it's aggressive or benevolent. It is harmful in any of its forms. I cannot stand bullying. I will always stand up to it, even if I am nervous or scared. I am super passionate about my writing, and am a hopeless romantic who has tossed myself over the cliff and there is no coming back from the pit of mushy passionate stuff I adore writing and plan to share with the world. That's not to say I don't enjoy angst and drama though. I love kittens, and cats in general. I want a black cat to name Salem. I am a super body positive fat babe and want you and everyone to love their bodies and wear whatever you want! All bodies are beautiful and handsome. Pretty much any bodice ripper. I’m so blessed to have found this amazing RP partner. So genuinely interested in screwing up our characters’ lives, it’s amazing. We write great tension together and I get SO excited to read her posts and send mine right back. She’s a wonderful new friend that I’m lucky to have.